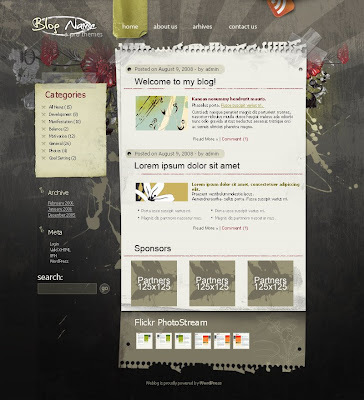 Hey guys check out this wonderful Creative Art Template a one of the kind template with nwe weblayouts. Download the txt file and upload it our blog, to edit navigation menu find this code div class=’Menu’ , and edit the links below div class=’Menu’ code. Since i’m not a flickr users i do not know to edit flickr section but you can find out how to put flickr album to blogs on the internet. I have made this template into a txt file so that u can just copy and paste in your blog edit in html region since many are facing problems from blogger uploading the template. How can I put something else in the post it note on the right instead of the categories widget?